I love trees and the thought of being able to grow oak, beech and other huge specimins in my back garden is very appealing. My garden is only 60 x 40 feet and the house is semi-detatached so I don't think that my neighbours would feel quite the same way. Insurance companies are not fond of large trees in close proximity to houses either. Bonsai would be a good solution. 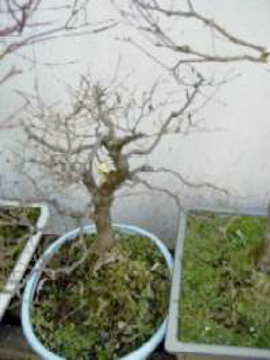 Until quite recently there was a bonsai nursery not far from my home. I went there a few times but never bought anything. I've always been interested in the art of bonsai. There was something fascinating about the thought of having a live tree that had been miniaturised. When I was young we had a Ladybird book that had pictures of these tiny trees. 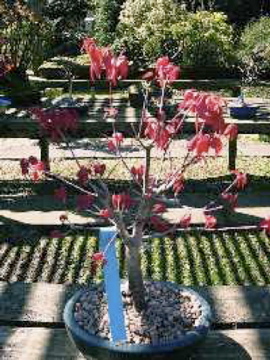 I've read quite a bit about the "how to" of growing a bonsai. I somehow think that I don't really have the patience to wait and care for these gorgeous trees. While I was visiting the nursery though I took some photos. The variety of trees that can be grown in this way is staggering. The three pictures show my favourites. Each of the trees were grown in a shallow tray and situated on a bench in the open air. I've read that it's best to keep the trees outside because that's where the full size trees grow and bonsais like to be in the same conditions. I love acers. Their red leaves look glorious all through spring and summer. I think I like the old one the best though. It looks very ancient. The tray with the conifers was an interesting idea though. 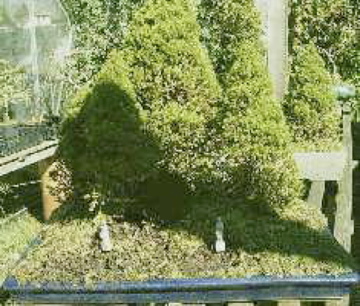 A sort of mini garden on a bench. Sadly the nursery has closed now, so I don't get to visit and enjoy the tiny trees any more but my fascination remains and I appreciate the work and art that is involved in making these miniature gardens. Join in and write your own page! It's easy to do. How? Simply click here to return to Bonsai.